Last week, the popular TEDx series returned to Cardiff for the first time since 2015, with a line-up including alumni Dr Mark Taubert (PgDip 2007, MSc 2010) and Dr Pete Burnap (PhD 2010) as well as Head of Cardiff’s School of Law and Politics, Professor René Lindstädt. 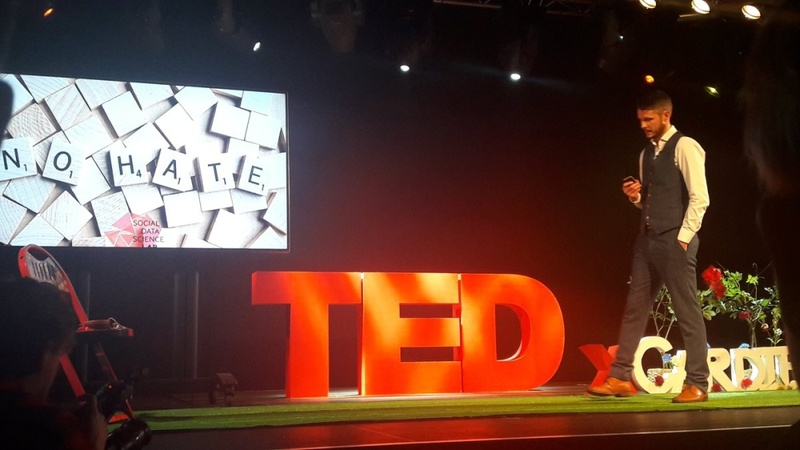 TEDx, a global series of innovative public lectures covering a wide range of topics, was sponsored by Cardiff University and held before a capacity crowd the city’s Tramshed venue on 22 April. “I meet such individuals daily in my job, and the insights they provide can, in a slightly paradoxical way, be very life-affirming,” he said, echoing the sentiments expressed in his open letter to the late pop superstar David Bowie. Dr Burnap, a senior lecturer at Cardiff’s School of Computer Science & Informatics and data scientist, discussed his around algorithms for the automated identification of hateful social media posts in the wake of trigger events such as the EU referendum. “We are able to mine millions of tweets and identify the hateful ones in real time, studying their volume over time and considering how and when they propagate,” he said. “I am very excited and honored to have been a part of TEDx Cardiff 2017. The line-up of speakers that the organizers put together was fantastic, and it was fantastic to hearing the other talks,” he added. You can find out more about TEDx Cardiff and watch previous speakers which include Professor Chris Tweed (PhD 1989) on their website.